Am I the only one who loves granola but detests raisins? And apart from a few heinously expensive brands on the market, it seems everything contains the little buggers. So with my very limited (read: absolutely shocking) cookery skills, I decided to create my own. Which also ended up with me trying to replicate my favourite Love bars from Pret, with hopefully less of the junk and calories and more wholesome ingredients. 1. For the granola, heat the butter and the syrup together and mix it with the three dry ingredients until it's all coated. 2. Then add to a lined tray and cook for 5-10 minutes on 180 degrees. Then thats it! Shake it up a bit and seal it for a perfect snack. It's not too sweet so you can add yoghurt, berries and whatever you fancy. With most granolas having a ridiculous amount of sugar in, thankfully this has a lot less. 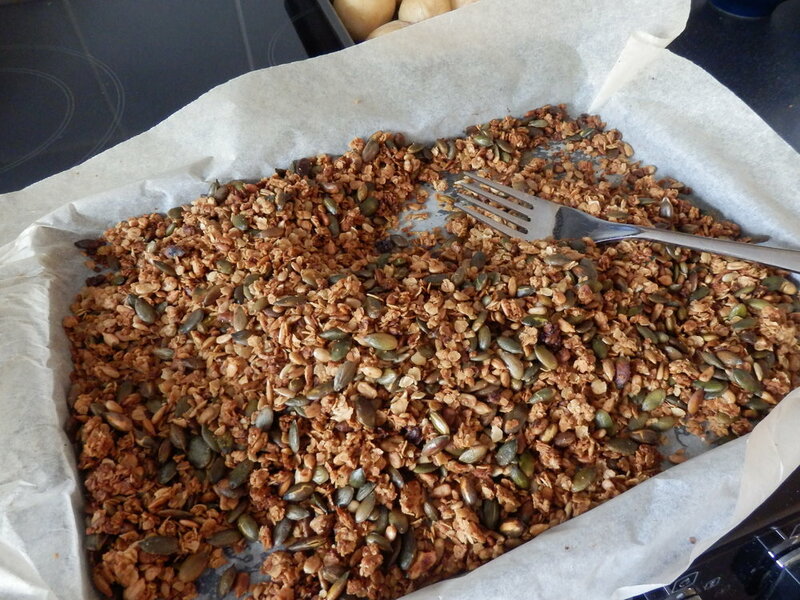 When looking at the deliciousness of the granola, I couldn't help but think: what more can I make with this? And upon my recent discovery that my favourite Love Bar from Pret had an obscene amount of calories in it, I thought why not make my own? I made a form of fridge cake instead, as the flapjack and caramel version is laden with calories. 1. Melt the dark chocolate and slowly add it to the granola. 2. When it's all mixed in, add it to a greaseproof paper lined tray and pack it together tightly. 3. Then chop up the pistachios slightly and add them with the goji berries to the top, pushing them in so they stick. And there we go! They made about 8 big bars or 16 bitesize. They're pretty filling and using my trusty calorie counter, one large one only equates to about 250 calories, filled with lots of seeds and none of the crap you can't pronounce. I may not be much of a baker but if you excuse me, I have some granola bars to gorge on.